C2EP reserves the right to take disciplinary action including censure, suspension of certification, and/or revocation of certification in cases of the violation of its certification standards or the Professional Operator Code of Conduct. 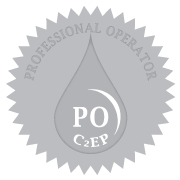 To ensure the most current information regarding an individual’s certification status, employers, certifiers, and other stakeholders should verify an individual’s current PO certification status by contacting C2EP at Info@ProfessionalOperator.org or 515-232-3623. The official C2EP certificate also features a raised foil seal and the signature of the C2EP Chair.